Add the finishing touch to your uniform by slipping into these high performance basketball socks! Built to perform long into the 4th quarter of the game, these socks feature arch support and cushioned bottom and will provide a consistently delivered level of comfort. 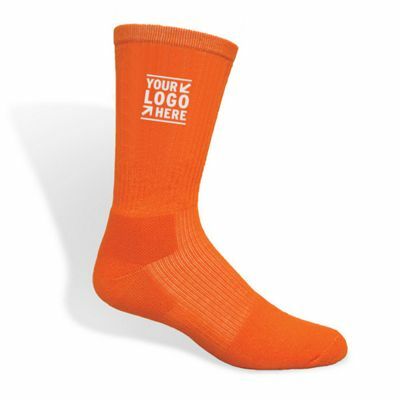 Each sock comes standard with the box design located on the back and bottom, your choice of sock color and a knit-in logo, which can wrap around the sock, using up to three colors. Similar to embroidery, the logo is embedded into the sock for maximum durability. Due to certain artwork constraints with this process, we highly encourage our customers to send artwork for final review prior to placing an order. Available sizes: Youth 7-9; Ladies 9-11; Men’s 10-13. Made in the USA.